Hidalgo County Court-at-Law No. 7 Judge Sergio Valdez, left, and state District Judge J.R. “Bobby” Flores. 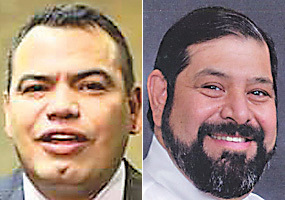 EDINBURG — An attorney representing the ex-husband of a state district judge’s daughter has filed a motion asking that a county court-at-law judge be recused from his client’s case because of a friendship between the two legal officials. The case stems from a 2016 misdemeanor charge in which Jason Miller of the San Antonio area is accused of violating a protective order filed against him by his ex-wife Kellie Flores of McAllen, daughter of state District Judge J.R. “Bobby” Flores. Several elected officials from the region have been pulled into the dispute, according to the motion to recuse, and the case has pit orders from two county court-at-law judges against each other. Abel Hinojosa, the attorney for Miller, filed the motion seeking the recusal of Hidalgo County Court-at-Law No. 7 Judge Sergio Valdez from presiding over the misdemeanor, citing a friendship between Valdez and Judge Flores, who presides over the 139th District Court. The motion was sealed immediately after it was filed Thursday afternoon at the Hidalgo County Clerk’s Office. Miller provided The Monitor copies of the motion and its 22 accompanying exhibits. Neither Judge Flores or Valdez responded to requests for comment left with their courts’ staffs Friday morning. Flores did not return a voicemail message left on his cell phone and calls made to numbers listed on Valdez’s most recent campaign finance report went directly to his court office. Hinojosa said he did not take lightly the decision to file the motion on his client’s behalf, noting that he has rarely filed such a motion during his three decades of practicing law. The motion to recuse Valdez from overseeing Miller’s criminal case stems from an earlier civil case out of County Court-at-Law No 5. On Feb. 3, 2016, in the midst of Miller’s divorce from Kellie Flores, Court-at-Law No. 5 Judge Arnoldo Cantu Jr. awarded her a protective order against Miller after an alleged domestic violence incident. The protective order prohibited Miller, who has two young children with his ex-wife, from communicating with her or the kids except through his attorney. The only allowed contact with the children was through supervised visits. This was not the first protective order filed against Miller, which he openly acknowledged after someone anonymously dropped off copies of two previous orders at The Monitor’s office Friday afternoon. Miller’s first ex-wife filed one order in 2004, he said, but he doesn’t recall being served. A neighbor filed another in 2012 following an argument over their dogs. Both orders were dismissed, according to court documents. On Feb. 18, 2016, less than two weeks after Cantu signed the protective order, Kellie Flores filed a report with the McAllen Police Department accusing Miller of violating it when he mailed their daughter several items. The police supplemental report lists those items as: “Teddy bear, some chocolates and a letter stating, ‘(Daughter’s name), Happy Valentine’s day! Daddy loves and misses you! Love Daddy.” The day prior to sending the package, Miller had texted Kellie Flores asking to see the children. Police issued an arrest warrant for Miller on Feb. 25, 2016, for violating the order, but McAllen Municipal Judge Kathleen Henley “advised she wanted to hold off on signing the arrest warrant in Mr. Miller’s name,” according to the supplemental report. On March 3, 2016, Adrian Garza contacted police about Miller being at court-at-Law No. 5 “in case” police had an arrest warrant for him. Garza is a former courthouse employee who most recently worked as a bailiff for Master Court No. 1, and whom Miller described as a close friend of Judge Flores. Police at this point “corrected the date of the warrant complaint,” which Judge Henley signed. Miller was subsequently arrested at the courthouse that day — March 3, 2016 — as he waited for a hearing to increase his visitation with the children. The resulting criminal case was assigned to court-at-Law No. 7, and Valdez arraigned Miller on the class A misdemeanor on Sept. 26, 2016, according to court records. If found guilty, Miller faces up to a year in county jail. The motion to recuse Valdez from Miller’s misdemeanor case “allege(s) that Judge Sergio Valdez will not provide a trial date because he is assisting (Kellie Flores) to circumvent County Court-at-Law No. 5,” and that Valdez “has made rulings that have been detrimental to Jason Miller,” namely by taking away his access to the children. “It’s almost going on three years and we’ve announced ready (for trial) at each court, and for whatever reason we’re reset,” said Hinojosa, who filed a motion for speedy trial in March 2018. Miller has been out on bond since his March 2016 arraignment. As a condition of posting bond, Valdez placed Miller on the Alternative Incarceration Program until trial. As part of the program, Miller is required to breathe into a portable breathalyzer device twice a day, down from the initial four times. While he admits to previously drinking heavily, Miller said he’s been sober since January 2016, yet has been unable to remove this bond condition. Hinojosa said a major factor in his decision to file the motion to recuse came when the judge allowed Kellie Flores to intervene in the case by filing her own motion, pro se, in July 2018. Her motion asked Valdez to modify Miller’s bond conditions and was filed separately from those filed by the assistant district attorneys trying the case. The ADAs, however, later adopted the motion at a July 26, 2018 hearing, during which the judge ultimately barred Miller from having any contact with his children. While not prohibited, Hidalgo County District Attorney Ricardo Rodriguez acknowledged it’s unusual for victims to file their own motions in misdemeanor or felony cases. Hinojosa’s motion to recuse Valdez claims Judge Flores’ influence may extend to the DA’s office. Judge Flores has presided over the 139th District Court since 2005. Kellie Flores “told Jason Miller that several Judges ‘owe’ her father because he helped put them in power. She also indicated that her father helped District Attorney Ricardo Rodriguez get elected,” the motion states. Rodriguez denied as much in an interview Friday. “I had never heard about this before in the sense of what the alleged victim is saying in reference to myself and Judge Bobby Flores,” Rodriguez said. During the July 26, 2018 hearing to modify Miller’s bond, Kellie Flores testified about various screenshots of Facebook posts, which, according to her pro se motion, “show a propensity for violence in the view of the victim in this case.” She did not take screenshots herself but was provided them by other people, including her sister, she said. Hinojosa argued during the hearing that Miller used social media to communicate with other veterans and that Kellie Flores took the remarks out of context and didn’t have the entire conversation. The judge said that in order to address the red flags “ahead of time,” Miller was not allowed to use social media and couldn’t “have any contact” with his children until Valdez had reviewed Miller’s medical and psychological records. Valdez set a hearing to review the records in October 2018, in which no action was taken regarding the bond conditions he imposed in July and no trial dates were provided. A month after Valdez ordered Miller have no contact with the children, another county court-at-law judge granted Miller unsupervised visitation in August 2018. While the misdemeanor criminal case has played out in court-at-law No. 7, the divorce and subsequent child custody matter has been working its way out in court-at-law No. 5. On Aug, 27, 2018, visiting Judge J. Manuel Bañales entered a final order granting Miller “extensive visitation,” according to the motion to recuse. Bañales was appointed to hear the family law case out of court-at-law No. 5 after Cantu voluntarily recused himself. Hinojosa, in the motion to recuse, contends the evidence Kellie Flores presented before both county court-at-law judges was the same. Kellie Flores’ attorney Katie Pearson Klein, who is representing her in the family law case out of court-at-law No. 5, said in an interview Friday that her client “respectively disagrees” with Bañales’ ruling and is appealing the judgment. “The court can only make findings in accordance with the evidence he hears, and we want the (13th) Court of Appeals to take a second look at the evidence that was heard… ,” Klein added. Miller has not seen his children, who are 5 and 3 years old, since Father’s Day, June 17, 2018. The affidavit also notes that Miller has struggled to get a job due to the pending legal matter. If Valdez does not voluntarily recuse himself from the misdemeanor case, the presiding judge of the 5th Administrative Judicial Region will assign a visiting judge to hear arguments from both Hinojosa and assistant district attorneys regarding the motion to recuse. That visiting judge would then determine whether there are grounds to remove Valdez from the case.